The Annual Brontë Christmas lunch took place on Saturday 6 December. As usual Jones Hayden acted as Master of Ceremonies. 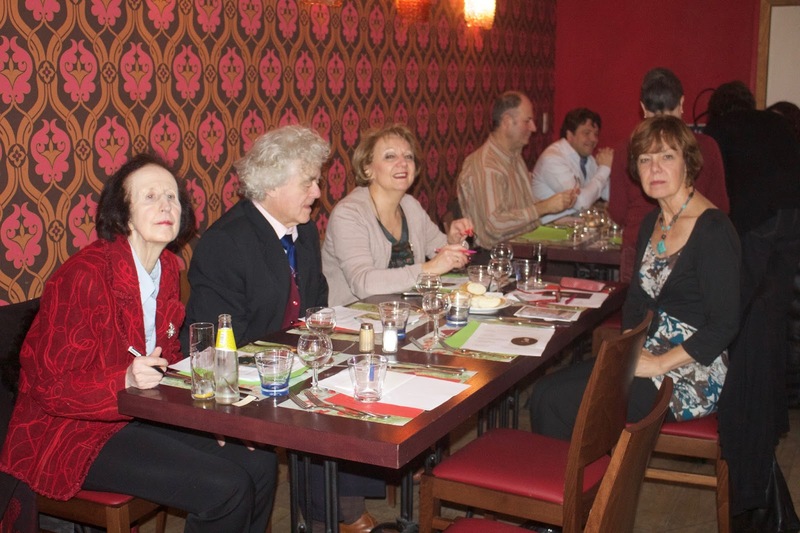 This year 35 people enjoyed the festive meal, in which the courses alternated with the various items of entertainment. After the initial welcome speeches by Helen and Jones, Paul Gretton entertained us with a reading of Thomas Hardy’s poem ‘The Oxen’. This was followed by Graham Andrews’ choice samples from ‘One Hundred Great Books in Haikus’. This year the skit was not just performed but also partly composed by some of our talented members. Tracie Ryan was the guide and Brian Holland, Kate Healy and Robynn Colwell the family being shown round the Parsonage in an adaptation of Victoria Wood’s monologue ‘The Haworth Parsonage Tour Guide’, with additions by Jones Hayden and the performers. A highly entertaining piece which generated a lot of laughs and was very well performed. 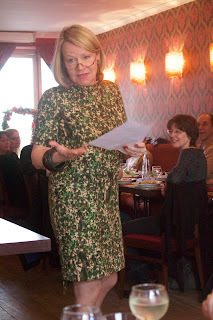 Myriam Campinaire gave a hilarious reading of a biography of the Brontës that deviated in almost every point from Claire Harman’s, written by Derek Roberts, a humorist who has now moved from Brussels but was formerly well known in expat circles here. He also composed the lyrics for ‘Belgian Commune Blues’ (listen to it on youtube!). Members acquitted themselves well in Jones’s annual Brontë Quiz, which was as full of tricky questions as usual. 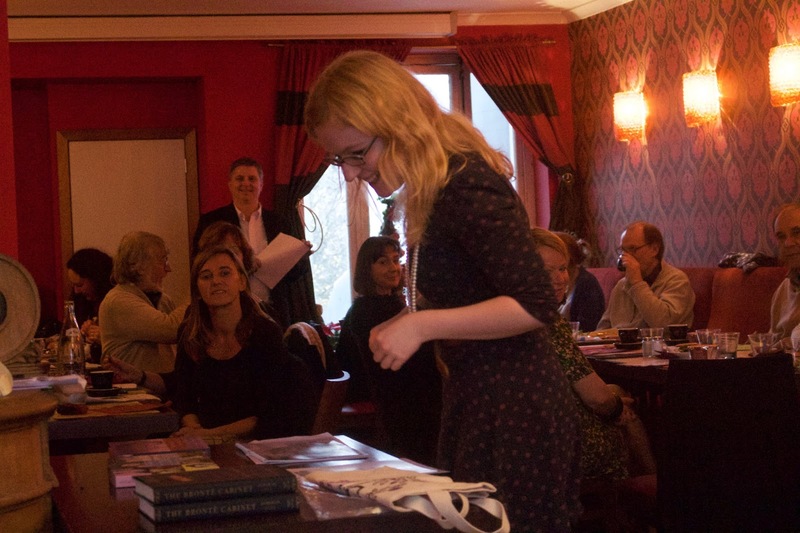 The raffle prizes this year included some of the year’s best-selling books about the Brontës: Claire Harman’s biography of Charlotte Brontë, Deborah Lutz’s ‘The Brontë Cabinet’, and Sheila Kohler’s ‘Becoming Jane Eyre’. One of the lucky winners in the lottery! We ended with ‘The Sans Day Carol’ led by Paul Gretton. 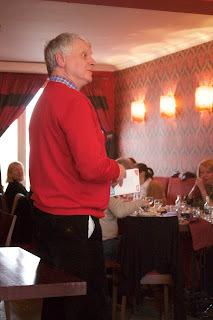 It was another enjoyable end-of-year lunch with Brontë enthusiasts. I think most of us are already looking forward to next year’s. 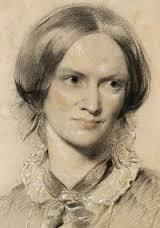 Next year will see some extra activities due to the bicentenary of Charlotte Brontë’s birth. Keep tuned in to our web-site, blog and Facebook page for coming events. 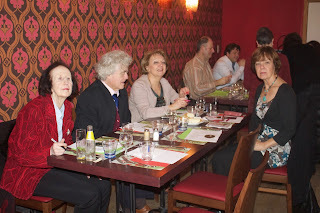 On 3 December ‘Les Soeurs Brontë à Bruxelles’, the French edition of Helen MacEwan’s ‘The Brontës in Brussels’, was launched at Librairie Quartiers Latins in Place des Martyrs. It was translated by long-standing Brussels Brontë Group members Myriam Campinaire and Daniel Mangano and published by CFC-Éditions, who run the Quartiers Latins bookshop. This publisher’s catalogue contains lovingly-produced, richly-illustrated books about Brussels. ‘Les Soeurs Brontë à Bruxelles’, an illustrated guide to Charlotte and Emily’s time in the city, forms part of the collection ‘La Ville Écrite’; in the same collection is ‘Les Écrivains dans la Ville’, a guide to the literary plaques and statues in the city. Helen MacEwan introduced the book in conversation with Frédérique Bianchi, who specialises in nineteenth-century literature and organises literary walks in Brussels, and Claire Billen, a retired ULB lecturer specialising in the history of Brussels. ‘The Brontës in Brussels’ is the first book dedicated exclusively to Charlotte and Emily Brontë’s time in Brussels. 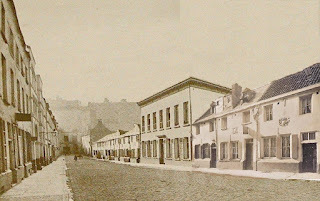 The French translation introduces readers to a little-known literary connection of Brussels and also to a historical period in the city (the 1840s, shortly after the Belgian Revolution) less thoroughly chronicled than the later 19th century, which saw its expansion and transformation under Leopold II. Numerous additional images have been included in this lavishly-illustrated French edition. It is always a pleasure to spend time in Quartiers Latins, a marvellous place a little off the beaten track and located in one of the most beautiful squares of Brussels. The genuine love of books that motivates the publishers and booksellers who work in this tranquil spot is almost palpable in the air. On 29 November 2015, Waterstones Brussels hosted the launch of a book about a Brontë biographer with Belgian links. 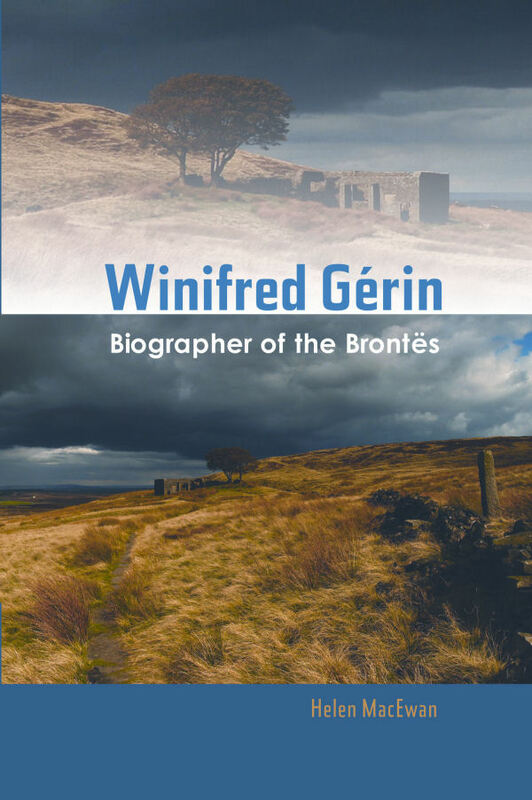 Winifred Gérin, who moved to Haworth in the 1950s to research her biographies of the four Brontë siblings, was the best-known Brontë biographer after Mrs Gaskell and before the historian Juliet Barker became the definitive chronicler of the family in the 1990s. Helen MacEwan’s life of Gérin draws on her unpublished memoir and on hundreds of letters to the family of her first husband, a Belgian cellist called Eugène Gérin. Helen met members of the family when researching the book, one of whom (a great-nephew of Eugène Gérin) attended the launch. Winifred Gérin’s colourful life took her to Paris, where she lived with her musician husband in the 1930s; to Brussels, where the couple were living at the time of the German invasion in May 1940; and to southern France where they found themselves trapped for the first two years of the War and became involved in helping Jews to escape arrest under the Vichy government. Having escaped back to England themselves, they worked for Political Intelligence near Bletchley Park. Eugène Gérin died in 1945. Ten years after his death, Winifred’s life changed direction after a first visit to Haworth on which she met her second husband, a Brontë enthusiast. 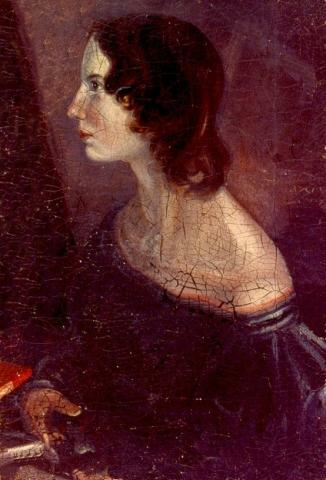 Once her Brontë biographies were completed she went on to write lives of other nineteenth-century women writers including Elizabeth Gaskell and Anne Thackeray Ritchie. 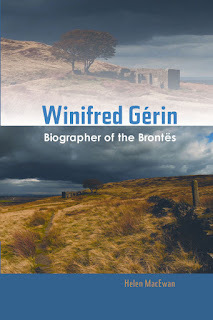 Around 30 members of the Brussels Brontë Group attended the launch and heard the story of the research for the book that uncovered the story of Gérin’s hitherto unknown life. 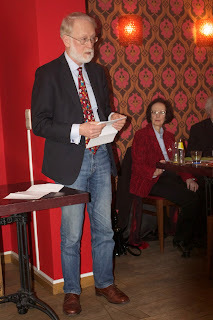 Previously, on 21 November, a launch was organised at Waterstones Piccadilly, London. It was attended by the publisher of the book, members of the Brontë and Gaskell Societies and people who helped with research.